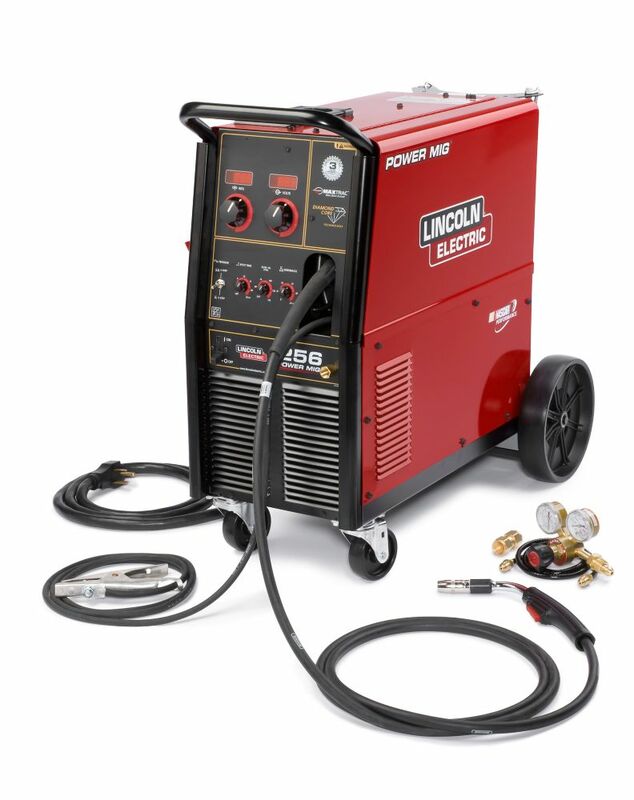 The Lincoln Electric POWER MIG 256 sets the standard for MIG and flux-cored welding in light industrial job shop fabrication, maintenance or repair work. Key features include : Diamond Core Technology, which delivers a forgiving arc, excellent out-of-position arc stability, low spatter and a wide voltage sweet spot at a given wire feed speed for steel, stainless steel or aluminum. MAXTRAC<sup></sup> cast aluminum industrial wire drive, which comprises dual driven rolls, regulated wire feed speed control, brass-to-brass connections and Lincolns 100% wire supporting split wire guide system. Digital meters, to easily display your preset voltage and wire feed speed. Includes a Magnum PRO 250L gun and cable 15 ft. (4.5 m), to make it easy to reach your work. The POWER MIG<sup></sup> 256 is spool gun ready for the premium Magnum<sup></sup> 250LX gun and spool gun capable with the Magnum SG (requires adapter). 230V input. 250 amps output / 26V / 40% duty cycle. 3 year repair warranty main unit (parts and labour). 90 days on gun assembly. The Campbell Hausfeld 115-volt stick welder (WS099001AV) is designed for home and shop applications. Easy to use and portable, this welder has a transformer design that provides an easy-starting, smooth arc. Weld with 1/16-inch electrodes on a 15-amp household circuit; a 20-amp circuit is required for welding with 5/64-inch electrodes. Thermal overload protection activates automatically to avoid overheating. Includes hammer/brush, starter pack of electrodes and hand shield. Duty cycle: 20% @ 50A, output 70A. Weld and ground cable length: 6 feet. Finish your projects faster and easier with Campbell Hausfeld - The Air Power Expert. The Campbell Hausfeld 120-volt PRO-140 MIG/FLUX welder (WG309000AJ) is designed for heavy-duty projects and repairs. The durable metal construction, oversized handle and professional gun is ideal for metal fabrication, repairs, maintenance and auto shop work. Five heat settings to match metal thicknesses up to 1/4 inch. Independent drive deck delivers consistently smooth wire feed. Includes dual-gauge regulator with hose, two extra contact tips and starter spool of flux-cored wire. Duty cycle: 20% @ 90A, output 140A. Weld and ground cable length: 10 feet. Finish your projects faster and easier with Campbell Hausfeld - The Air Power Expert. The Century Inverter Arc 230 is a versatile DC inverter based stick welder. Lightweight and portable, this handy 230V input machine can weld between 18 gauge to 5/16" steel without issue. Includes several accessories to get you up and running fast. Consumable welding electrodes sold separately. The AC-225 Stick Welder is Lincoln Electric<sup></sup>'s best selling arc welder of all time. The AC-225 produces an extremely smooth AC arc for welding a wide variety of materials including carbon, low alloy, and stainless steels as well as cast iron. Full range 40-225 amp selector switch quickly sets the welding current and ensures a uniform arc each and every time you weld. PowerMig 256 The Lincoln Electric POWER MIG 256 sets the standard for MIG and flux-cored welding in light industrial job shop fabrication, maintenance or repair work. Key features include : Diamond Core Technology, which delivers a forgiving arc, excellent out-of-position arc stability, low spatter and a wide voltage sweet spot at a given wire feed speed for steel, stainless steel or aluminum. MAXTRAC<sup></sup> cast aluminum industrial wire drive, which comprises dual driven rolls, regulated wire feed speed control, brass-to-brass connections and Lincolns 100% wire supporting split wire guide system. Digital meters, to easily display your preset voltage and wire feed speed. Includes a Magnum PRO 250L gun and cable 15 ft. (4.5 m), to make it easy to reach your work. The POWER MIG<sup></sup> 256 is spool gun ready for the premium Magnum<sup></sup> 250LX gun and spool gun capable with the Magnum SG (requires adapter). 230V input. 250 amps output / 26V / 40% duty cycle.